NORTH OLMSTED, OH--(Marketwired - Jun 11, 2013) - Move over Mr. and Mrs. Homeowner, singles are taking on home ownership in a big way. As more single men and women are purchasing homes by themselves, they're also rolling up their sleeves and tackling home improvement projects on their own. While men may do more projects overall, women are giving them a run for their money when it comes to DIY. Moen Incorporated surveyed hundreds of consumers to determine just how different guys and gals are when it comes to planning and executing home-related projects. If you answered false to any of these statements, you're incorrect; all of the statements above are true. In fact, 39 percent of all heads of households are single, and what's even more surprising is most of them are women. And the trend is continuing: according to the 2011 NAR Profile of Home Buyers & Sellers, 18 percent of recent home sales were made by single females, compared to men at around 10 percent. Take a look into the lives of these singles to discover some of Moen's key findings in the battle of the sexes: DIY edition. When it comes to home improvements, today's busy singles aren't afraid to take on projects. On average, both single men and women take on four home improvement projects per year. From those big and small, Moen actually found that more men are planning to do dining room and basement remodels in the next 12 months compared to women, who have their sights set on the bathroom. In addition to how often homeowners take on DIY projects, Moen sought to find the motivation behind some of these renovations. While half of single women said home improvement projects kept them busy, more men responded as wanting to try to keep up with the latest trends and preparing for major life changes (36 percent and 28 percent respectively). Women have a reputation of loving to shop. And while that may be true for personal indulgences -- it's not the same for home improvements. Moen found that men would spend an average of $25 more on supplies and materials to make home repairs than a woman would. Another big cost for remodeling is hiring extra help. Not all DIY projects can be easy to achieve alone, however, more and more singles are looking to take on projects themselves. When it comes to less labor intensive or more detail-oriented home improvements, such as installing cabinet knobs, new window treatments or a shower rod, it seems men don't want to be bothered with the little things. Moen's research shows that more women than men would handle these projects themselves instead of hiring someone else to do it for them. From entertaining to cooking, in general, we all know that women tend to spend more time in the kitchen. However for single ladies, remodeling this space isn't a project they are looking to tackle on their own. They -- more often than men -- will hire help or rely on a friend or family member for assistance. When it comes to kitchen remodels, men take on the actual physical labor more than women do. And in the kitchen, what changes matter most? According to the survey, women are more interested in making upgrades to kitchen cabinets and countertops, while 20 percent of men would prefer to upgrade or replace appliances. And (happily for Moen!) 57 percent of all men and women would be ready, willing and able to replace their kitchen faucet as a DIY project. Updating a kitchen faucet is a simple job that homeowners can do by themselves, and this one simple change can have a dramatic impact on the entire look and feel of the kitchen. "We interact with our kitchen faucet on a frequent basis every day, so if yours is not up to the job or simply doesn't reflect your personal style, it's time for an update," said Tom Tylicki, wholesale kitchen product manager, Moen. "Moen's pulldown kitchen faucets with MotionSense™ technology make it easy to do routine tasks with speed and efficiency -- and while having some fun! A simple wave of the hand sets water in motion -- no touching of the faucet is required. "And, replacing a kitchen faucet can be a surprisingly simple do-it-yourself project," he continued. "Easy directions are enclosed, or you can use online installation guides and videos. Even the hands-free MotionSense faucet should take less than half an hour to install." It may not come as a surprise, but from planning to execution, women are more hands-on in each phase of a bathroom remodel. When asked about their dream bathroom, 20 percent of women wish for a bigger bathroom. "And even if consumers can't have a bigger bathroom, overwhelmingly consumers want to create a retreat with luxurious, spa amenities and luckily these are easy installments that can 'shower' consumers with immediate, therapeutic, relaxing results," says Rebecca Kolls, senior director consumer strategist, Iconoculture/CEB. Women are also more willing to take on small upgrades themselves more than men; when asked what their top three DIY bathroom improvements would be in the next 12 months, 29 percent of women would switch out their own faucets and lighting, compared to only 16 percent of men. Home renovations can be a stressful task, especially for a single homeowner -- which is why a little research and inspiration can be a big help. Moen found that in general, women consume more media when searching for DIY inspiration. HTGV is the largest source for research amongst single homeowners; 55 percent of women and 40 percent of men turn to the network for ideas and instruction. The hard lines we may have believed true in the past about men doing the labor and women doing the dreaming are blurring. When it comes to saving a few pennies, creating something beautiful yourself, and having more control over the results -- there's something very attractive about DIY projects, no matter whether you're a man or a woman! 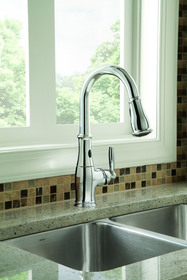 For more information about Moen and its products, call 1-800-BUY-MOEN or visit moen.com. As the #1 faucet brand in North America, Moen offers a diverse selection of thoughtfully designed kitchen and bath faucets, showerheads, accessories, bath safety products and kitchen sinks -- each delivering the best possible combination of meaningful innovation, useful features, on-trend styling and lasting value. Moen is part of Fortune Brands Home & Security, Inc. (NYSE: FBHS), which creates products and services that help fulfill the dreams of homeowners and help people feel more secure. For more information, please visit www.fbhs.com.